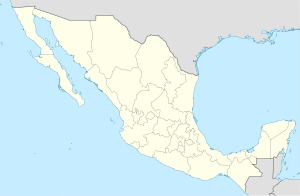 Santiago Papasquiaro is a city located in a valley in west-central Durango, Mexico. It is the fourth-largest community in the state in population, and is the municipal seat of the municipality of the same name. As of 2010, the city of Santiago Papasquiaro had a population of 26,121. The town of Santiago Papasquiaro is situated on the eastern slopes of the Sierra Madre Occidental, and it is located at an altitude of 5,742 ft. above sea level. The municipality has an area of 7,238.4 km² (2,794.76 sq mi) and a census population of 48,482 as of 2015. During the past few years, the city has improved vastly. Agriculture is a vital part of the town's economy. Several famous bands are from Santiago Papasquiaro, such as Banda Aventurero. Also one of the most famous grupero bands from Santiago Papasquiaro are Los Bondadosos. Santiago Papasquiaro is also the home of Mexican Army's 71st Infantry Battalion barracks. ^ "Santiago Papasquiaro". Catálogo de Localidades. Secretaría de Desarrollo Social (SEDESOL). Retrieved 23 April 2014. ^ "Estado de Durango-Estacion: Santiago Papasquiaro (SMN)". Normales Climatologicas 1951–2010 (in Spanish). Servicio Meteorologico Nacional. Retrieved 1 July 2016. ^ "Extreme Temperatures and Precipitation for Santiago Papasquiaro (SMN) 1938–2009" (in Spanish). Servicio Meteorológico Nacional. Retrieved 1 July 2016. This page was last edited on 11 February 2019, at 05:04 (UTC).